At Distilled, we are fortunate enough to get to work with a number of startups like Reevoo, Huddle, Razoo and GiftRocket. Most of the startups we speak to know that SEO is a crucial part of their marketing plan, and they rely heavily on search to increase traffic, clients and even brand awareness. We love seeing what startups are able to do with SEO, as their speed and “get things done” attitude allows them to be creative and generate some real cutting-edge work. Inspired by the success stories we have heard recently, we decided that it would be great to hear more about how startups use SEO to help grow their business and to reward them for their great efforts. With that, we're excited to announce the SearchLove Startup Competition! This October we are hosting SearchLove, our renowned advanced SEO conference, in New York City for the first time. The conference is scheduled for October 31st and November 1st. With a line-up of industry experts presenting their most advanced SEO tactics, the two days will be a great chance for a startup to pick up a ton of tips and ideas to take back to their team. Our winners will also automatically be signed up for a site clinic with a top SEO. If that’s not enough, there will also be a rocking Halloween party on the 31st! It's simple - Just let us know about how SEO has rocked your world. Creative ideas -> Did you make the best infographic ever or are you a YouTube king? Show the world how your SEO campaign helped you hit targets or how it is helping you on your way to success. The entries will be reviewed by the Distilled SEO team, including Will Critchlow, Tom Critchlow, John Doherty and Kate Morris. The top five entries will be included in a follow-up blog posts (with links, naturally) that will share your great success stories with the rest of the SEO community. You can enter using this form. Better yet, post your response to your own blog and tweet it at us (@distilled) with the hashtag #SearchLove! If you post your entry in your blog post, link back to us so that others can learn about the competition as well! We would really like to hear from startups directly, but we are also keeping this competition open to any search or marketing agencies who have had excellent results for a startup client. 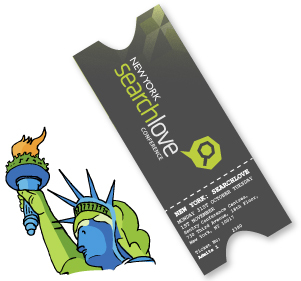 We are super excited to receive entries from around the world, but please take into consideration that the prize is two tickets for SearchLove in New York and that travel expenses will not be included. Winners will receive tickets to the conference, tickets to the SEO Halloween Party on the 31st, and food and beverage during the two days of the conference. Travel and accommodation are not included. Q. What will SearchLove be like? Q. How do I know it will be awesome? Q. What will the conference videos be like?